The Soup Lady likes nothing better than when someone else does the work. To that end, I enthusiastically recommend trawling the internet until you come across non-food blogs that have called for recipe submissions. The Carnival of the Recipes is one of the more interesting ones. Conceived and originated by Beth of She Who Will Be Obeyed! , it's the ultimate Real People/Real Recipes collection. The submissions are dishes that people actually like so much that they wish to share with others. It wasn't easy but I managed to maintain my lurker status until this gem showed up thanks to Cathy of Blue Heron at Druid Labs. I like this soup because it's simple yet rich and it's very easy to whip up. 1 bunch celery, 1 medium onion (chopped), 3 tablespoons of butter, 3 3/4 cups light vegetable or chicken stock, 2 egg yolks, 2/3 cup of half and half, 1 cup of crumbled blue cheese, salt and pepper to taste. Reserve the inner leaves from the celery and chop the remaining celery. Melt butter in a large saucepan. Gently cook celery and onion, covered, until soft. Add stock and bring to a boil. Simmer 20 minutes or until vegetables are tender. Cool slightly. In a food processor fitted with a metal blade or a blender, process mixture to a puree. Return puree to pan and reheat gently without bringing to a boil. To finish the soup, beat egg yolks and half-and-half in a small bowl. Stir a small ladleful of hot soup into the egg mixutre and pour back into the pan. Stir in crumbled blue cheese, stirring constantly until soup thickens. Season with salt and pepper and garnish with inner celery leaves. Serve immediately. Cathy writes these additional tips: "The recipe calls for Stilton, but gorgonzola works fine as will any strong blue. It's far easier to use a wand blender [to puree], and you don't have to wait for the soup to cool. If the soup is to be held, be sure to reheat gently." The Soup Lady is a big fan of handheld blenders. Not only is it faster, easier and neater than using a food processor, but the big advantage as I see it is that there is far less washing up to do. For the ultimate in low kitchen clean-up, see if you can fox someone else into making the soup and taking a picture of it so you can see what it looks like. Thanks, Cathy! I'm enjoying your soup site. Here's a soup recipe that's been in our family since the 1960's and always keeps popping up. It's a couple generations down the line now and everyone still seems to really love it and it couldn't be simpler to make. It goes really well at brunches, etc. or just anytime. It's also a "pretty" soup to serve. My kids think of it as an old family recipe, yet I can remember Grandma Sophie (I have one too!) being excited over this recipe when she found it, probably in some newspaper or magazine. Anyway, enjoy! NOTE: There is no milk in this dish. Don K.
Place potatoes, carrots & onion into a pot, cover generously with water and boil until carrots are done. Add peas, and continue to boil until peas are cooked. Reduce heat to simmer, add cheese. (Do not boil after cheese is added.) Add salt, pepper to taste. Add just a hint of garlic powder. Serve hot. "For the record, Velveeta is pasteurized process cheese spread and Velveeta Light is pasteurized process cheese product. Cheez Whiz is labeled as pasteurized process cheese sauce, although that type isn't noted in the Code of Federal Regulations. " 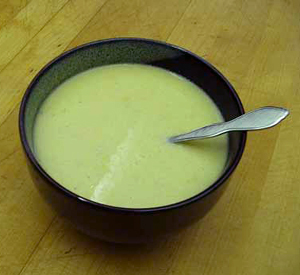 The Soup Lady often publishes mail from readers who wish to share their soup recipes. This is the first time that a recipe has been contributed by a fictional character. This recipe was developed by Abe Cohen, the main character in Dragon, the story of a man who turns his back on Hollywood for a more 'normal' life in Arizona. (Author: Trudy W Schuett ) I catagorized this recipe in the Real People/Real Soup section because I figure Abe is at least as real as food brand characters Betty Crocker, Uncle Ben, the Jolly Green Giant or Snap, Crackle and Pop. Brown beef in butter or oil, add veg and mushrooms, sauté. Add spices and seasonings. Add barley, rices, and lentils, in whatever combination you have on hand, with total volume adding up to about 2 ½ cups. Add 6 cups of water to start, adding more as the soup cooks depending on the consistency desired. We allow a minimum of 2 hours for the soup to simmer—this recipe works well in the crock-pot. Just dump everything in and walk away. It helps to sing as you add the herbs. ;>) Dancing is optional. This recipe also freezes and reheats well in the microwave. We freeze it in individual portions. We're having Beefaroni! It's beef and macroni! Beefaroni's full of meat. Beefaroni's fun to eat. Beefaroni's really neat. Hooray! Whee! For Chef Boy-ar-dee! Are we sick yet? We�ve had plenty of time to rebreathe germs from those around us, and the weather certainly has been ideal in most of the country to drive everyone indoors and deprive us all of fresh (low germ concentration) air. Now is the time to pull out the chicken soup. Here is a recipe carried down for many generations. I know it as "Grandma Sophie's Chicken Soup". I'm sure her mother and generations before made the same. Each person took this recipe and tailored it to the food stuffs available at the time. I know Sophie never wasted ANY part of the chicken cause as I young child, once she had enough chicken fat in the freezer, she would deep fry it with onions and us kids would eat it like popcorn! Imagine why our cholesterol is so bad! This is a simple recipe in that there are only a few necessary ingredients. In actuality, it can be made REALLY simple by dumping all ingredients into a large soup pot and simmering for a few hours, skim it, cut the chicken off the bones (it will fall off anyway) and serve. But my recipe is somewhat more involved and I find it to be the best "Jewish Penicillin" available. One large chickenwhole broiler or parts, or just breasts, or just dark meat, or just wings, whatever you have, but it is best to use a whole chicken. (Put aside the gizzards for other recipes if they pack innards inside the chicken where you by it). 4-8 carrots depending on size and how sweet you want the soup. I like lots. one large onion... type is not critical. If you have smaller ones, use more. Fresh dill or if necessary, dried dill. This will be to taste. I like a good amount, some people prefer less. If the chicken is kosher, it will have enough salt. If it isn't, DO NOT ADD SALT ANYWAY. You can always serve the soup with a salt shaker and let people add. Some people like to make noodles, dumplings, matzo balls, whatever. I like mine simple. Large soup pot, enough to place the chicken in, cover it in water and still have 1/4-1/2 of the pot available. High heat until boiling, cover, lower to simmer, and allow to simmer for an hour to 90 minutes (according to size of chicken). After that, take out chicken, place in large bowl, and start removing skin, meat, etc. Place skin and all bones back into the stock and allow to simmer (low flame) for another hour. The meat can be cut into small pieces and placed in the fridge until later. After an hour, turn off heat, place large soup pot in sink, use large strainer and strain from current pot into new pot. Place on stove top on low heat, allow to settle (about 10-15 minutes) and skim off fat from top using soup or whatever works for you. Put in celery cut into half stalks, carrots, cut into thirds, whole onion(s) and raise heat to medium-low. Allow to cook covered for about 30-45 minutes. Remove onion(s) and squeeze out juices from onions into soup and discard the remainder of the onion (unless you have another use for it). Now put in the chicken pieces that were set aside earlier and lower to low heat. Cover and simmer another 10 minutes. Put in the dill weed, cover, shut off heat and allow to sit for about 10-15 minutes before serving. This reheats as well as when it is fresh. It will gel in the fridge but instantly turns back to soup in the microwave or stovetop. An alert reader has written to say: "Dear Soup lady, Winter's coming! Gotta put out a recipe for bavarian liver (meatball) soup!" Well, the Soup Lady doesn't know anything about Bavaria, but she does know Mig, the genial host of Lost In Transit. As a former Seattle resident now living in Vienna, he knows a thing or two about soup weather. Lost In Transit is a group weblog by expatriates and emigrants around the world, writing about their experiences. Web User Magazine says: "More informative than a dozen Michael Palin travelogues, Lost In Transit is a top destination." The Soup Lady heartily agrees with that - it's the first place I went to get this authentic Austrain recipe for Leberknoedelsuppe. Sure, you can do internet searches to get a list of ingredients and instructions, but where else can you get an Aunt Mitzi? dumpling soup because chopping/grinding the liver makes more mess than she likes. Her best friend Mitzi, however, does make a good liver dumpling soup, so I asked her for a recipe. She cooks by heart now, rarely using recipes, but she agreed to write one down for the Soup Lady. This soup is generally served as a first course. is foamy. Soak the rolls in milk first to soften them, press out the milk and rip into small pieces. Mix with the ground/chopped liver, parsley, bread crumbs, onion and garlic and sautee for about 15 minutes. "A few tips may be helpful, particularly for less experienced dumpling makers who are exhorted not to give up at the first miscooked, collapsed dumpling. " - Dough made of bread, the crumbs of bread rolls, semolina, must be allowed to "rest" for a while in order to absorb moisture. - Dumplings as garnish in soup, meat and liver dumplings, bread dumplings should be rounded with wet hands. - It is advisable to cook one dumpling first as a trial. If the inside is "dry," i is a success; if it is too solid, add liquid (soup, milk, water); if it tends to fall apart, perhaps bind with egg and/or flour. - Leave the saucepan in which you boil dumplings half uncovered: only yeast dumplings should be cooked with the saucepan lid wholly on. - Drain the dumplings carefully and serve in a warm dish. If dumplings are to be kept warm and you do not have a steamer, put them in a colander on top of a saucepan of hot water. I thought I would share one of my favorite soup recipes, which I got from a wonderful old lady from Savannah GA, since, sadly, deceased at a great age. Her name was Ruth Poggenpohl. Don't know where she got it from - some ante-bellum grandmother perhaps. She was a genius at simple, delicious, but unusual foods. Very simple, and a little piece of heaven. We generally pick the better meat scraps off the carcass when the stock is done and toss them in with the veggies. As you can tell from the vague instructions, you can do whatever you like. Make stock from turkey carcass, leaving in small bits of meat. Dice veggies and cook in a small amount of water and a bit of butter. Add veg to the trained stock along with the tomato soup. 5 minutes before serving add pickles and juice. Serve with a blob of sour cream on top. For the cook: Don't worry too much about what you are serving to your guests. They will eat it anyway. If it's burned, scrape the black part off. If it's undercooked, throw it back in for a while - they will have plenty of other stuff to eat while it finishes. If you forgot something that you planned to have on your menu, don't sweat it - no one will know unless you tell them. Don't compare your dinner with Aunt Sally who has been hostessing the family event for 35 years, or with your cousin's new wife who had theirs catered by Jean-Luc last year - this dinner is yours and yours alone. If what you offer comes from the heart, that is all anyone can ask for. Accept all help for assistance in the kitchen. Be sure sure that you follow the rules of basic sanitation and good hygeine. For the guests: Don't show up empty-handed. Ask before hand what you can bring to contribute to the meal. If the hostess politely declines to tell you, bring something anyway - a sweet for dessert, a bag of gournet coffe beans or a fancy canister of tea, or a pineapple wrapped in a new dishtowel. Eat from the selection of dishes that are on the menu. If you are on a diet, work with what you have. If you have special medical needs for your food, then you know what you can and cannot have. Don't make a big deal about how the food that is offered does not fit your food plan. Offer to help. Try to stay out of the way during the last-minute preparations -help is most appreciated after the meal during the clean-up. If you can't bear the idea of spending the time after the holiday meal with your hands in the sink and up to your elbows in suds, take out the kitchen gabage; keep the small kids busy; ofer to take the dog for a walk. Advice about children: have a kids' table and seat your litittle guests together there, but do it in a positive way, not as if you are telling them they are not fit to sit at the big table. If you don't have a lot of space for an extra table, spread out a plastic tablecloth somewhere out of the way and let them have an indoor 'picnic'. They will try to get themselves to the big table, but pleasantly redirect them. In the long run, they will talk about the kids' table for years to come and be happy that they sat at one. Let them provide decorations. If they made turkeys out of brown paper bags, let that be the centerpiece. Use the placecards they made and let them wear feathers and pilgrim caps during the meal. Take them to a party store and let them pick out a tissue paper turkey or a foil garland to string around. Don't get worked up over food stains on their clothing or spilled plates of food - it's going to happen so just relax. You can clean it later. Advice about seniors: Listen to your uncle's same old stories - again. So what if you heard them before? Let the old ladies help with the dishes. I know you want to give them a break after all the years that they stood on their feet feeding you, but maybe they like doing dishes. Let them. Repeat what you just said as many times as it takes in case they didn't quite catch all the words. Let them hold the babies, but don't expect them to babysit. General advice: Turn off the TV. Use your good manners. Be nice to everybody. Remember what you are thankful for. 2) There is little chance of finding it elsewhere. Part one: Good rainbow trout. If you can catch one and filet it, best you can get! If you have a favorite fish monger and can get fresh rainbow trout, secondbest you can get. If you can't get trout (of any sort), get something similar as long as it isfresh! If you have one of those rangetop smokers, GOOD! If you have a BBQ and know how to smoke fish on it, GOOD! If you have neither and no one else will smoke the fish for you, BAD! Smoke the fish. Type of wood... Well, some people swear on alder or cherry. Me, I like hickory or mesquite. To each is/her own. Part two:Obtain good lump crabmeat. If you can catch blueclaw crabs (like the old Marylanders I knew used to do), GREAT! If you can GET fresh blueclaw crabs, EXCELLENT! If you want to order from places like legal seafood, YIPPEE! If you can get decent crabmeat somewhere, OK! If you haveta use the canned, jarred, supermarket stuff, well, so be it. Part four: Soup pot... large... like 6 quarts... on stove with about, um, 29 ounces of water (I got that from my other recipe. It just sounds right!) Bring to simmer. Add diced potatoes, celery, onions, and if you like mushrooms, have at it. Oh, and garlic. You will see in a while that you will be making a decision shortly. Do I want white or red chowder??? At this point, if you know you want red, add diced carrots. If you want white, no further action required at this moment. Simmer covered for an hour. Add two bottles of clam juice. I use Doxsee and I do not know the size. It's little bottles. It's about a cup. 1/4-1/2 tsp. white or black pepper. White seems to be better for white soup. 2 tsps each oregano, parsley, thyme. 1 tsp dill. Cover and simmer for another hour. Are you the Manhattan chowder type? Diced tomatoes. A couple of 14.5 oz cans or a large can. I like the Italian diced tomatoes myself. I also like to add hot sauce at this point if making red. Yourchoice on that. A few bay leaves goes well in the red version. Are you the New England chowder type? Instead of tomatoes, use about 1 1/2 cups of half and half, stir in 1/2 tsp butter, and then stir in 1 p of flour. It may seem wrong to make the red version with fish and crab but I like it either way. Some people like to add wine to this recipe. I did not care for the combination of half and half and chardonnay, but you may try it to see ow you feel about it. I also have yet to find a red wine that is delicate enough to enhance the red version. Experiment if you desire! We don't want to kill the fish, crab or destroy the creaminess if making the white version, so, stir as you add these ingredients, keep the flame low, and allow to slowly simmer for about 10-15 minutes tops. Enough to incorporate the fish/crab into the soup. That's it. To the best of my memory. I hope someone out there tries this! It's much more work then I like to do but it is so worth it!! If you haven't determined this about me yet, I never add salt while cooking! If you want, try sea salt to your taste. I have added sea salt when I'm eating this and it seems to go well with the theme of fish chowder. Our friend Howie likes his soup served in a nice tureen. How about this one, found at Rus-sell.? Well, the Peanut Soup recipe that I posted generated a lot of excitement. A link to a Malaysain version made with pork ribs was left in the comments of that original post and this vegan version came to me in the mailbag. I like the looks of this and I especially look forward to serving a sweet soup that is topped with the sharpness of scallions. This soup is heat and sustenance and comfort. We have been eating it fall and winter for many years and now it's a fundamental part of Thanksgiving dinner. Politically it's a good choice as it satisfies the vegetarians and the gluten intolerants are happy too! It comes from "Sundays at Moosewood Restaurant." Saute the onions in the oil until just translucent. Stir in the cayenne and fresh ginger. Add the carrots and saute a couple more minutes. Mix in the potatoes and stock or water, bring the soup to a boil, and then simmer for about 15 minutes, until the vegetables are tender. In a blender or food processor (or with one of those cool hand-held soupifyer beater stick things), puree the vegetables with the cooking liquid and the tomato juice. Return the puree to a soup pot. Stir in the peanut butter until smooth. Taste the soup. Its sweetness will depend on the sweetness of the carrots and sweet potatoes. If it’s not there naturally, add just a little sugar to enhance the other flavors. Reheat the soup gently, using a heat diffuser if needed to prevent scorching. Add more water, stock or tomato juice for a thinner soup. Serve topped with plenty of chopped scallions or chives - Important.